In recent years, the jib has grown greatly in popularity with its ability to shoot from all angles and to run on dolly wheels or track. Although great for the studio or for use behind the goal at a football match, most lack the essential portability that todays producers demand. 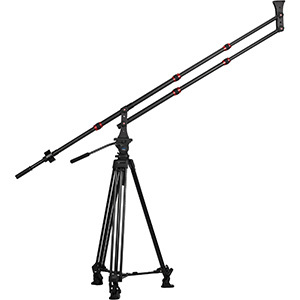 (There is an exception check out the Acebil telescopic carbon fibre jib!). There is now an emphasis on mobile kit its almost an obsession. Incredibly, the full-sized DSLR is starting to be considered unwieldy. Shoulder-mounted camcorders are used by a diminishing customer-base and its no surprise that the hits of NAB were smaller systems Blackmagic Designs URSA Mini and Micro cameras, Panasonics DVX200 and Canons XC10. Even lights are shrinking in size we have just introduced an Aputure LED panel the size of an iPad which has an amazing 1920 Lux output at 1 metre. Its this shift in buying patterns that has seen a massive rise in our business for light weight tripods and mini jibs, and on-camera LED lights and the demand for a portable, affordable mini slider. 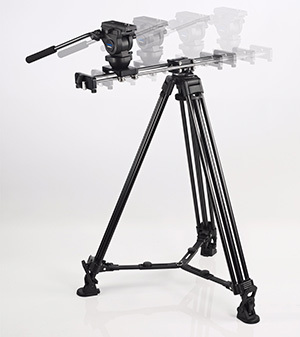 The traditional slider is a familiar piece of equipment in the studio and on location. Typically it sits on the floor or is supported between two tripods and gives wonderfully smooth results. However, sliders are not problem-free. Relying on multi-point support, cheaper slider models especially longer units - have a tendency to bend or distort under a heavy weight. The response of many manufacturers to increase the robustness of the slider is simply to employ stronger materials. This adds significantly to the weight. This results in heavy duty models that tend to weigh as much as 10kg and can support huge payloads in excess of 35kg. The payoff is also a very large price tag. Eschewing this approach, other developers have experimented with new materials, especially carbon fibre. Although the results are impressive, the price tag can be eye watering. Surprisingly, the savings in terms of weight are fairly limited while the sliders travel distance tends to be much shorter than with models using traditional metals. Theres another, more ingenious solution. Rather than providing a continuous track, an alternative approach employs an extending rail system which keeps the overall length of the unit to a minimum. 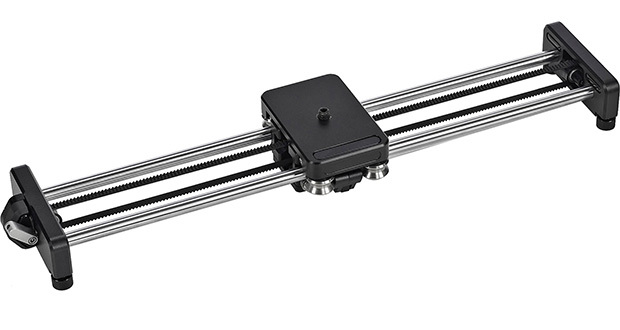 The tracking mechanism (with adjustable resistance) allows the actual rails of the slider to move thanks to a belt pulley system. Its action is still very silky and delivers smooth tracking shots whether standing on its retractable feet or mounted to a tripod. This solution has been adopted by a number of manufacturers and has other advantages. For forward movements using a wide angle lens for example, users of full length sliders run the risk of shooting the rails at the bottom of the picture. With the extending slider design, this classic shot where the camera physically moves towards the subject as the lens zooms out is now within reach of every operator, with or without a Hollywood budget. Packed down to a mere 39cm, Acebils new S15 + PLUS slider is a great example and has been critically acclaimed by reviewers and was very well received on the Kit Plus Tour. Less than half the length of competitive systems, its easy to pack into a carry bag or backpack. Its 1.8kg weight is less than half that of traditional designs so its even suitable for use in travel kits. Despite this miniaturisation, the S15 still achieves 53cm travel (sliding motion) and an 8kg load capacity.